However, that size comes with a cost, as Texas has continually struggled with healthcare problems, and some of those problems are issues of substance abuse and mental health. The landscape of addiction treatment programs in Texas is as vast and diverse as the state itself, providing an equal range of challenges, opportunities, and lessons in the fight against drug abuse. What’s changed? How is Texas transitioning from its lowly healthcare rank to becoming a “national and international model for reform,” where an estimated $2 billion are saved in closing prisons and giving Texas its lowest crime rates in years? As California refocused its efforts away from going after nonviolent crime (as part of the equally contentious Proposition 47), Rick Perry took note. When the National Association of Drug Court Professionals bestowed upon him the National Award for Criminal Justice Reform, they noted his action in “[combining] accountability and extensive treatment.” Perry himself pointed out Texas’s focus on “specialty courts” that provide exclusive and distinct treatment services for patients from all walks of life, giving millions of Texans an alternative to being put into prison without any care or consideration given to social or mental health factors. It’s a drastic change from 2010, when Texas came 49th in the country in per capita expenditures for mental health services. Then, the state spent less than $1 for every $3 spent per patient in other states. Today, Texas is closer to the national average for mental health services expenditures. A specific part of the drive goes towards reducing waitlists at community mental health services. July 2013 saw more than 5,200 adults and 190 children who were waiting to receive care at such facilities. The Texas State Legislature put aside around $48 million for community health centers to hire more psychiatrists, or do whatever they felt was necessary, so that the people who required mental health services the most could get them. In 2010, the Houston Chronicle broke a story on the rise of prescription drug abuse in Texas, finding that 1,900 of the state’s residents died every year as a result of overdosing on their medication. In response, addiction expert Jane Maxwell led the calls for state legislators to fund a system to track prescription drugs in real time, and to create a system whereby state authorities could monitor overdose deaths to improve their responses. Today, an organization like the Texas Mental Health Counselors Association works to provide the practice of mental health therapy services and education thereof, as well as influence policy that benefits the field.28 Other groups, like the Bay Area Council on Drugs and Alcohol, or the Mental Health Association of Greater Houston, provide geo-specific services and resources to residents of some of the most populous cities in the United States. The measures may be working. 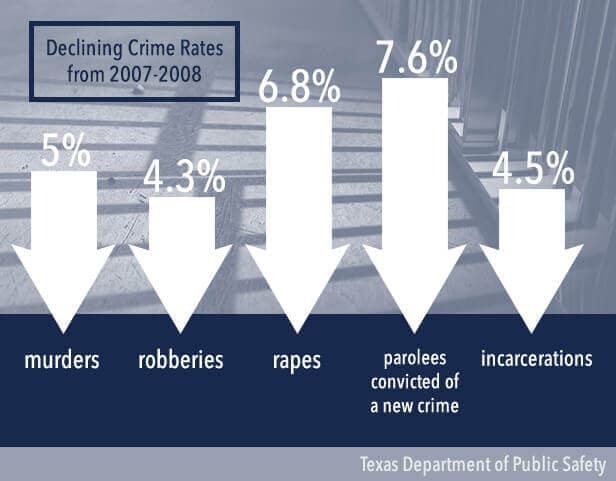 The Texas Department of Public Safety released statistics that showed from 2007-2008, the state experienced a 5 percent decline in murders, a 4.3 percent drop in robberies, and a 6.8 decline in rapes. The number of parolees convicted of a new crime dropped 7.6 percent, and the number of incarcerations went down 4.5 percent. And to Rick Perry’s point that his investing in drug courts saved the state billions of dollars, The Daily Beast mentions that it costs the state of Texas $50.04 a day to hold someone in a maximum-security prison. Putting them in an appropriate probationary system costs Texas $3.63 a day. Texas’s proactive approach in adopting drug courts is part of the reason there are 2,800 drug courts across the United States (as of 2014). Drug courts refer more individuals to treatment programs than any other criminal justice system in America, says Globe News Wire in writing about Rick Perry’s award from the National Association of Drug Court Professionals. 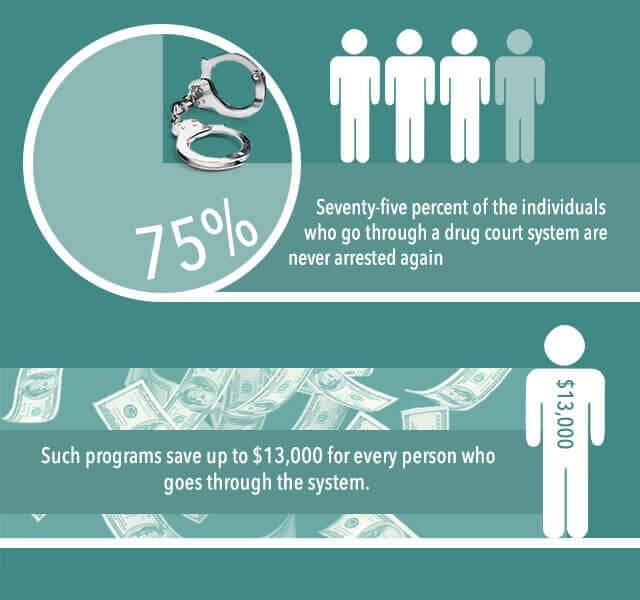 Seventy-five percent of the individuals who go through a drug court system are never arrested again, and such programs save up to $13,000 for every person who goes through the system. For various reasons, Texas has enjoyed (and endured) a reputation for being unrelentingly tough on crime (PBS explains that the state executes more convicts than any other, at a rate that far outpaces any other state). 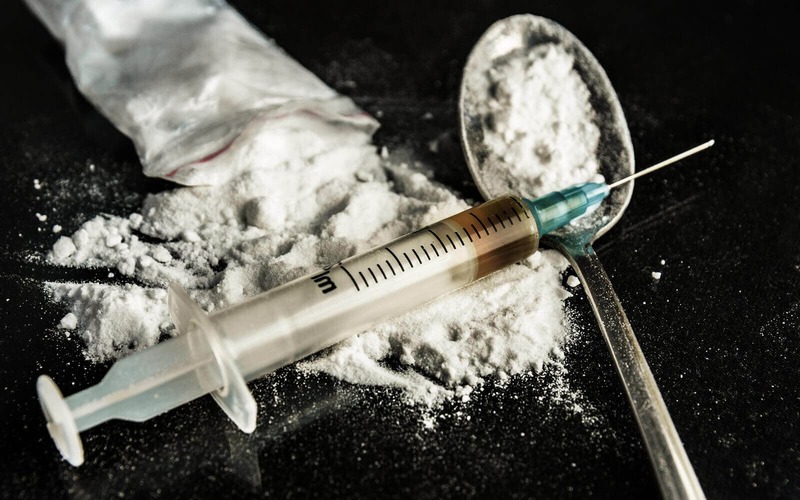 But with a growing understanding of the myriad causes of drug addiction, as well as the harmful effects of wholesale penalization and incarceration, Texas’s forward-thinking approach to changing its landscape of treatment and therapy might be the tipping point in the fight against drug abuse. In June 2014, the Community Epidemiology Work Group pulled together a report on drug use within the state of Texas. That report, as published by the National Institute on Drug Abuse, contained some good news. For example, cocaine use was on the decline throughout the state, and MDMA use declined as well, though these declines may be due to an increase in abuse of synthetic stimulants and synthetic cathinones. Many people in Texas have turned to the abuse of heroin, and there were 307 calls to poison control centers due to this drug in 2013 alone. But where there is a problem, there is always a solution. For people living in Texas, that solution involves innovative treatment programs. And there are plenty to choose from in the state of Texas. Here are some of the options available. Shades of Hope: People with addictions, eating disorders, or both can benefit from enrollment in this treatment program. There are two formats to choose from: One lasts for six days, and the other lasts for 42 days. Both rely on a 12-Step foundation, such as that developed by Alcoholics Anonymous. Since the founders know that the return to home after residential treatment can be fraught, they offer extended residential care after formal treatment. This continuing care plan can help people to learn how to stay sober, even when they’re not living in a protected environment. People who don’t wish to enroll in a residential program can also take advantage of an online-only program that provides counseling from the comfort of a person’s home. Find out more by contacting the facility. Center for Life Resources: This program was originally designed to assist people with a variety of mental health problems that could impact overall quality of life. As part of that suite of services, program administrators began to deliver outpatient substance abuse services. This help is available to both teens and adults who have substance abuse issues, even if those issues have resulted in legal action. People with financial difficulties may be able to get funding through a grant, so they can get the help they at no cost. Find out more by contacting the administrators. Serenity House Drug and Alcohol Treatment and Prevention: This is one of the oldest treatment programs in Texas, as it has been serving clients for more than 30 years. During that time, more than 30,000 people have sought care for drug or alcohol addiction through this program. Medical detox, inpatient rehab, and outpatient rehab are all available through this program. Individual counseling, group counseling, and family counseling are all available, too. There is a 12-Step focus to all of the therapies provided. Find out more with a call to 866-795-4673. Alcohol and Drug Abuse Council for the Concho Valley: This is San Angelo’s only long-term, non-prison drug and alcohol treatment facility. There are two facilities devoted to residential treatment: One is for men, and one is for women. Participants obtain individual counseling, group counseling, relapse prevention training, and outreach to housing placement upon completion. Women with young children can bring them to treatment, and they can receive additional training in parenting skills. The facility also offers outpatient treatment, and there are multiple support groups to attend, too. Medicaid is accepted, and there is financial assistance for people who qualify. Summer Sky Treatment Center: This drug and alcohol treatment program has served over 10,000 people since it opened in 1985. Men and women, adult or adolescent, are welcome in this program. Most people begin with a free consultation to ensure that they are right for the program. Then, medical detox followed by placement in either inpatient or outpatient treatment is provided. Treatment programs last for 30 days or 90 days, and significant aftercare services are provided, to keep people on track after the program is complete. Admission staff is available around the clock. Star Council: This program is mainly known for drug and alcohol abuse prevention. Teams often provide counseling to teens and preteens in a classroom environment, hoping to help these young people avoid the perils of drugs and alcohol as they age. This program also provides treatment for people who are 18 and older who suffer from addiction. Services include an in-depth assessment, onsite drug testing, individual counseling, group counseling, parenting education, and more. Medicaid and private insurance are both accepted, and there is a sliding scale of fees for those who cannot afford the full price of admission. There are four locations to choose from. Touchstone Ranch Recovery Center: This program provides more than a simple treatment program for addiction. Program administrators incorporate equine-assisted therapy into all of the treatment programs offered. That means people who enroll in these programs have the opportunity to spend time with, work with, and learn from horses. That opportunity could bring about healing that people just never thought possible. Care is delivered on an inpatient basis, and most private insurance policies are accepted. The program does not accept Medicaid, Medicare, or Tricare. Call 888-988-5128 to find out more. La Hacienda Treatment Center: La Hacienda opened for business in 1972, and since that time, thousands of people have come to this treatment program for care. It is a residential facility that offers four fulltime, board-certified medical doctors and one fulltime, licensed psychiatrist on staff. That team of medical doctors is supported by more than 55 licensed professionals, including physicians and nurses. Around-the-clock medical care is provided in the medical detox unit, and daily checkups are provided to anyone enrolled in the program. Counseling, therapeutic activities, and meditation are all provided as part of the healing process. The campus is situated high on a hill, overlooking a gorgeous Texas valley. Most private insurance payments are accepted. Hill Country Council on Alcohol and Drug Abuse: This nonprofit organization offers a variety of mental health services to people in need. Outpatient treatment programs for drug addiction are available, as are court-ordered treatment programs. A confidential assessment starts the process rolling, and when that is complete, professionals provide a referral to the appropriate level of care. The program also offers case management to people with complex issues that might require a variety of different solutions. Archway Recovery Center: This program is designed for people who struggle with sobriety, but who do not need to live in a residential program in order to get better. In most cases, people who use this program have completed a residential program, and they need additional treatment before they can live at home. Archway uses sober living homes for safe housing, and participants enroll in intensive outpatient programs at Archway for their recovery. Traditional 12-Step programming is provided, augmented with equine-assisted therapy. Major private insurance programs accepted. Cenikor: This organization has multiple outlets, including some in Louisiana and many in Texas. It’s been in operation since 1967, and it is a completely nonprofit organization. People with an addiction to alcohol or drugs can benefit from medical detox, followed by either long-term or short-term inpatient programming. When that is complete, people may benefit from additional care on an outpatient basis. That’s also available at Cenikor. Men and women, adults and adolescents, are welcome to enroll. Most insurance plans, state funding, and sliding-scale private pay are all available to make care affordable. Each facility has its own strengths and inner beauty. Enrollment coordinators can help families to find the right program for them. Stonegate Center Recovery Community: This residential addiction treatment program is marketed as an affordable option for men struggling with alcohol and/or drug abuse. The treatment setting is home-like, allowing men to come together and learn from one another. Counselors focus on providing one-on-one interactions, rather than group counseling, so the men can obtain personalized and customized care for their addictions. The therapy has a Christian focus, and men are encouraged to augment that spiritual care in their private time. Private insurance programs are accepted, and the enrollment staff is willing to call ahead for referrals and other enrollment paperwork details. Lending options are available, too. Starlite Recovery Center: This recovery center has been in business for more than 50 years. Substance use disorders are the primary focus of care, but people with mental health disorders may also benefit from treatment in this facility. There are several different tracks or programs available. The young men’s program is for people ages 18-28, the adult program is for men and women older than 18, the Christian program offers a faith-based recovery focus, and the freedom program is made for people in the LGBTQ community. There’s also a family treatment program for people who hope to support someone in the midst of a recovery plan. The campus is located on 55 acres of Texas hill country, and there’s an equine component to some programs. Private insurance payments are accepted, but people should expect to go through a referral and screening process before enrollment. ABODE Treatment, Inc.: This organization’s name is an acronym that stands for Adult Basic Opportunity Development Environment. In essence, the developers of this organization believe that adults struggle to overcome addiction or behavioral issues due to a lack of basic skills. The developers hope to help adults boost those skills, and they have several different program tracks that might help. Some people benefit from residential, inpatient care. Others benefit from outpatient care. Some need both, as they aren’t ready to head home when inpatient treatment is complete. Administrators can provide placement assistance, to help guide enrollment in the right program. There are two residential facilities and four outpatient facilities available. Phoenix Associates Counseling Services, Inc.: With locations in both the Dallas and the Fort Worth areas, this organization aims to offer intensive outpatient treatment programs for addiction without cutting into a busy professional’s work or home life. Meetings are held in evenings and on weekends, when most businesses are closed. The treatment team is small, and the staff endeavors to provide large-scale treatment with a small-town feel. Christian Farms Treehouse: A Christian environment of health and healing characterizes this program. Men and women are welcome to enroll in this residential treatment facility for help with addictions, mental health issues, or both. This program emphasizes 12-Step meetings and 12-Step learning, in addition to specific life skills, including parenting skills. Residents have access to group counseling, individual counseling, relapse prevention planning, and exercise opportunities. There is 24-hour-per-day supervision available, and there are opportunities for entertainment, including televisions and a fully stocked library. Medicaid is accepted, as are private pay options. Managed Care Center for Addictive and Other Disorders: This private, nonprofit organization was formed to deliver a comprehensive continuum of care for people struggling with addiction issues. The organization provides some addiction awareness resources, including classroom education, but the group also provides both inpatient and outpatient programs for addiction. There are also special services available for women, adolescents, and people with co-occurring mental health conditions, such as depression or anxiety. Services are available to everyone, regardless of their ability to pay for care. An enrollment screening is required in order to determine proper treatment placement. Tarrant County Medical Education and Research Foundation: This organization was founded in 1970 by a group of treatment professionals who wanted to deliver drug and alcohol recovery services to people in the community who might not be able to pay for those services with private funds. This nonprofit agency is funded, in part, by the Texas Commission on Alcohol and Drug Abuse. It can offer low-cost or even free services to people who meet specific financial guidelines. Services provided include a methadone maintenance treatment program, addiction counseling, and referrals to additional care. Maintenance and Recovery Services: Medications are often key to long-term recovery from a painkiller or heroin addiction. This organization, known by its acronym MARS, offers methadone and Suboxone therapies for people in recovery. In addition to medications, the facility offers counseling, education, and addiction resources. Group counseling, individual counseling, and couples counseling are all available, offered by trained and qualified counselors and therapists. Financial assistance is available to those who qualify. Call 512-339-9757 for more information on the North Austin campus. Lubbock Lighthouse: Medication management for opiate/opioid addiction is the focus of this treatment program, but the program offers much more to people who enroll. Clients also have access to a variety of counseling options. People can work with licensed counselors, therapists, and other mental health specialists. They can attend 12-Step support group meetings, and their families can access their own form of counseling to boost the chances of healing. Meetings are held at convenient times, so people aren’t required to miss work in order to get well. Private payment is accepted, and fees are kept low. Aspire Addiction Recovery Center: This facility focuses on action-based learning. People who enroll in this intensive outpatient program for addiction are asked to engage in daily activities with a high level of responsibility, so they can learn to define their ability to live in recovery. Therapies provided are evidence-based, so they have a background in solid science. There are two locations to serve people in Texas. People can continue to live at home while getting help from Aspire, or they can live in one of the nearby sober living homes while in care, so they have a safe and sober place to stay while they heal. Great Oaks Recovery Center: This facility, located in Egypt, Texas, provides a full continuum of addiction care. That includes medical detox, residential-based rehab, and continuing care. A typical client of this facility will go through a thorough assessment process, move into the facility for treatment, and then stay engaged with the staff and alumni after treatment is complete. The facility itself is truly gorgeous, with lush grounds and high-end decorating touches. Major insurance programs are accepted. Covenant Hills Treatment Center: This Christian-based treatment center is part of the Pacific Hills family of rehab facilities. The program specializes in helping people with co-occurring mental health issues, as well as people who have a history of relapsing to alcohol or drugs. Clients can choose from a traditional 12-Step recovery track or a modified Christian 12-Step program. All clients are asked to participate in individual counseling, lectures, group counseling, and psychotherapy. All clients are also asked to develop a personal relationship with a Christian God. Enrollment comes with a guarantee. Those who complete treatment and relapse within one year can return for a week of treatment at no cost. Most major insurance programs are accepted. Benchmark Recovery Center: This luxury addiction treatment program in Austin, Texas, is made for people who have a history of dropping out of traditional treatment. These people need longer and more intense treatment stays in order to combat an addiction, and they can get that at Benchmark. The facility is on 70 acres of gorgeous grounds, and the programs offered are gender-specific. After spending 90 days in a residential program that focuses on the 12 Steps, people move into company-owned sober living communities for a full 12 months of aftercare monitoring. This is an intense program that isn’t right for everyone, but people who just haven’t been able to recover in traditional treatment might benefit from this program. Burning Tree: This program is also made for people who have a history of chronic relapse to alcohol or drugs. This residential program uses a 12-Step recovery approach, and people can enroll in one of two beautiful treatment facilities: One is in Dallas, and the other is in Austin. Both have vibrant recovery communities that help to boost the chances of long-term recovery success. These communities also have active employment scenes, and Burning Tree works to place clients in rewarding jobs, which also helps to boost sobriety. People can stay at Burning Tree as long as they would like, as there is no forced graduation out of the program after a specific timeframe. Sunspire Health Texas: 3800 Country Road 444, Princeton, TX 75407. This facility offers detox, residential, partial hospitalization, intensive outpatient, and LGBT tracks. Right Step: Over 20 Texas locations. 844-817-0968. This facility offers medical detox, intensive outpatient, partial hospitalization, and sober living. The Arbor Treatment Center: 1443 CR 103, Georgetown, TX 78626. This facility offers residential care for addiction, including medical detox. It accepts both insurance and private pay. The Last Resort: 1620 FM 535, Smithville, TX 78957. This program is for men only. It provides partial hospitalization and residential care for addictions, including addictions complicated by dual diagnoses. Insurance and private pay are accepted. The Springboard Center: 200 Corporate Drive, Midland, TX 79705. Inpatient detox, intensive outpatient, and residential care are all provided. Insurance and private pay are accepted. Sante Center for Healing: 914 Country Club Rd., Argyle, TX 76226. Residential treatment and intensive outpatient treatment are available. Major insurance programs are accepted, as well as private pay. Enterhealth Ranch: 524 N. Lincoln Park Rd, Van Alstyne, TX 75495. Residential treatment with a medical focus, made for people with a dual diagnosis issue, is the focus of this facility. Insurance company payments are accepted. Promises Austin: 840 Co Rd 420, Spicewood, TX 78669. Medical detox and residential treatment are provided on a luxury campus. Grapevine Valley Hope: 2300 William D. Tate Ave., Grapevine, TX 76051. Inpatient and outpatient addiction treatment are offered. Private insurance is accepted. The Ranch at Clear Springs: 3662 Patton Lake Road, Aquilla, TX 76622. Residential treatment for drugs and alcohol is provided on a luxurious campus in the heart of Texas. Phoenix House: 400 W. Live Oak St., Austin TX 87804. 888-671-9392. Adults and adolescents can get assistance with addiction, mental health issues, or both at this residential treatment program. Major insurance company payments are accepted. Nexus Recovery Center: Two campuses in Dallas. Treatment for adolescent and adult women is available. Mothers can bring their children with them into treatment. Payment options are available for low-income women. Carrollton Springs: 2225 Parker Rd., Carrollton, TX 75010. Inpatient and outpatient mental health and addiction care is available on a gorgeous campus. Insurance payments are accepted. The Ranch at Dove Tree: 1811 13th St., Lubbock, TX 79401. Residential treatment with a customized approach is available. Major insurance providers are accepted at this beautiful west Texas location. Cheyenne Center: 10525 Eastex Fwy, Houston, TX 77093. Residential, transitional residential, and outpatient treatment for addiction is available with a nondenominational approach. “Texas State Facts.” (n.d.) 50states.com. Accessed September 9, 2015. 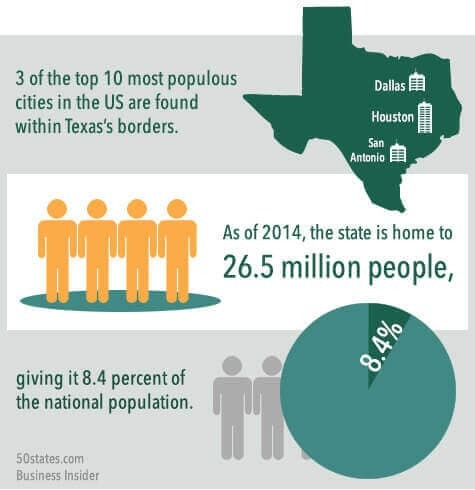 “13 Mindblowing Facts About Texas.” (July 2014). Business Insider. Accessed September 9, 2015. “State Growth and Debt Rank.” (n.d.) USGovernmentSpending.com. Accessed September 9, 2015. “Texas Ranked Worst in the Nation for Health Care by Gov’t Agency.” (July 2012). New York Daily News. Accessed September 9, 2015. “Feds Rank Texas Worst Healthcare Provider.” (July 2012). Houston Chronicle. Accessed September 9, 2015. “U.S. International Borders: Brief Facts.” (November 2006). Federation of American Scientists. Accessed September 9, 2015. “Everything You Ever Wanted To Know About Illegal Immigration (But Didn’t Know Who To Ask).” (November 2010). Texas Monthly.Accessed September 9, 2015. “Democratic Group Says Texas Poverty Up, Exceeding National Average, on Rick Perry’s Watch.” (January 2015). PolitiFact. Accessed September 9, 2015. 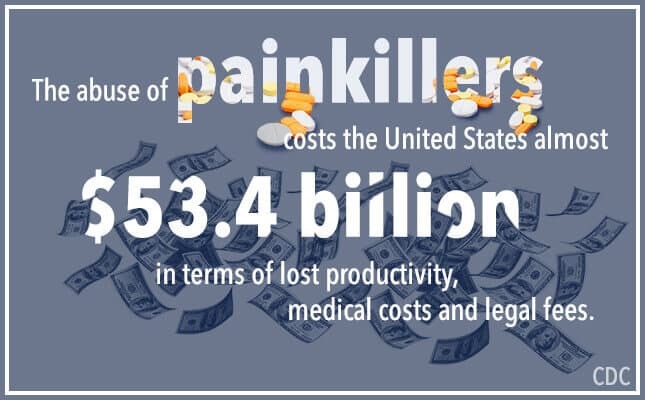 “Prescription Drug Abuse: Strategies to Stop the Epidemic.” (October 2013). Trust for America’s Health. Accessed September 9, 2015. “Prescription Drug Overdose Data.” (April 2015). Centers for Disease Control. Accessed September 10, 2015. “Texas Governor Rick Perry Receives National Award for Criminal Justice Reform.” (April 2014). Globe News Wire. Accessed September 10, 2015. “What is a Veterans Treatment Court?” (n.d). Justice for Vets. Accessed September 10, 2015. 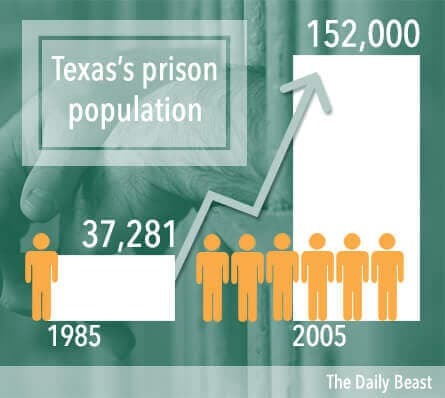 “Prison Reform is Bigger in Texas.” (April 2014). The Daily Beast. Accessed September 10, 2015. “California’s Prop 47 Deals Blow to War on Drugs.” (January 2015). Newsmax. Accessed September 10, 2015. “Californians Vote to Weaken Mass Incarceration.” (November 2014). The Atlantic. Accessed September 10, 2015. “Justices, 5-4, Tell California to Cut Prison Population.” (May 2011). The New York Times. Accessed September 10, 2015. “New Year Brings Cautious Hope For Mental Health Care.” (January 2014). The Texas Tribune. Accessed September 10, 2015. “Abuse of Prescription Drugs is on the Rise Across Texas.” (December 2010). Houston Chronicle. Accessed September 10, 2015. “College Drinking.” (n.d.) National Institute on Alcohol Abuse and Alcoholism. Accessed September 10, 2015. “Cheap Drinks and Risk-Taking Fuel College Drinking Culture.” (September 2014). NPR. Accessed September 10, 2015. “Substance Abuse Trends in Texas: June 2013.” (n.d.) University of Texas. Accessed September 10, 2015. “The Dangers of Binge Drinking.” (n.d). University of Rochester Medical Center. Accessed September 10, 2015. “Adults to Blame for Teen Drinking Culture.” (November 2010). Dallas Morning News. Accessed September 10, 2015. 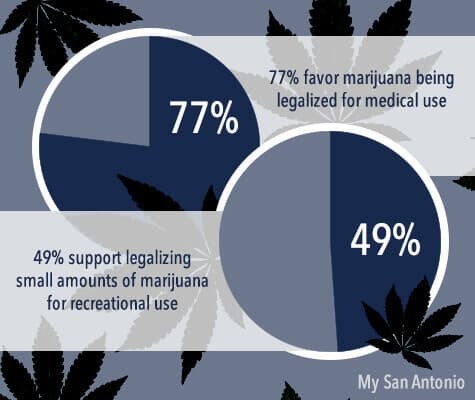 “Texans’ Attitude Shifting Along With U.S. On Legalizing Pot.” (February 2014). My San Antonio. Accessed September 11, 2015. “Gov. Rick Perry, in Davos, Touts Texas as Model for Progressive Drug Policy Short of Decriminalization.” (January 2014). Statesman. Accessed September 11, 2015. “Texas Drug Control Update.” (n.d.). Office of National Drug Control Policy. Accessed September 11, 2015. “Drug-Free Communities Support Program.” (n.d.). Office of National Drug Control Policy. Accessed September 11, 2015. “Texas Mental Health Counselors Association.” (n.d.) Texas Mental Health Counselors Association. Accessed September 11, 2015. “Chapter 2: Texas Crime Analysis.” (2008). Texas Department of Public Safety. Accessed September 11, 2015. “Why Is Texas #1 In Executions?” (n.d.) PBS. Accessed September 11, 2015.